Whenever I go to a restaurant, I employ one of two ordering strategies. Strategy number one involves seeking out the most unique/rare dish on the menu. If the restaurant offers something that can’t be found anywhere else, then carpe diem! Strategy number two involves identifying the restaurant’s “signature dish.” If a certain dish made the eatery famous, then I want to know first-hand what all of the hubbub is about! At Saigon Bistro in Lakeside Village, either strategy results in the same choice. 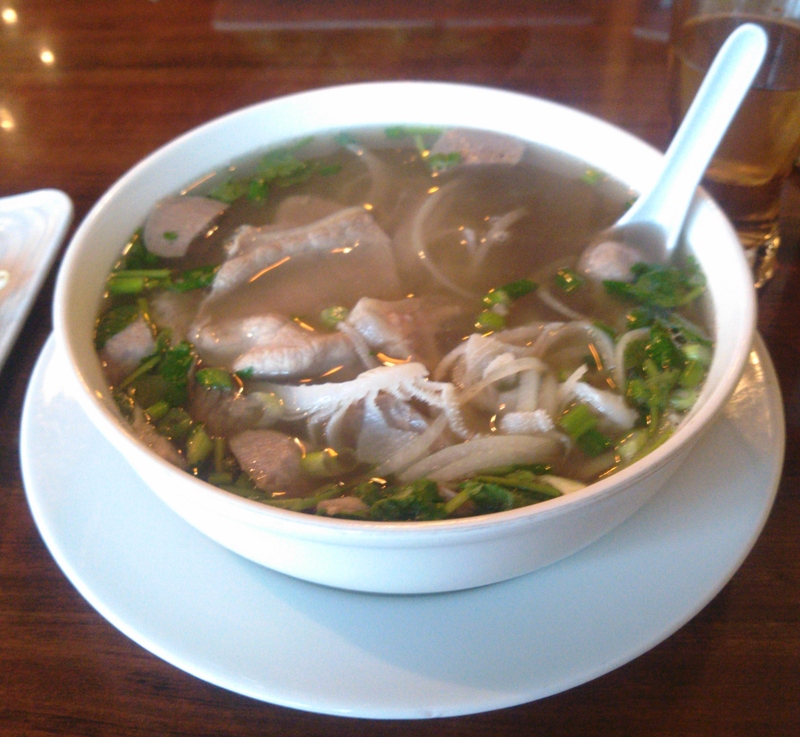 Behold… the pho! 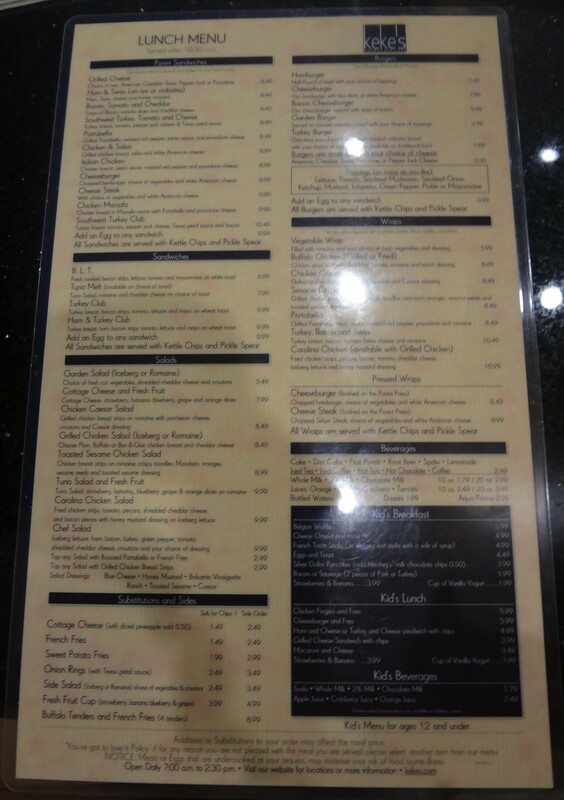 Aside from the customizable protein choices, Saigon Bistro also features customizable seasoning options. Think of it this way; an iconic American street food is the hotdog. Some people prefer their hotdogs with ketchup, others with mustard. 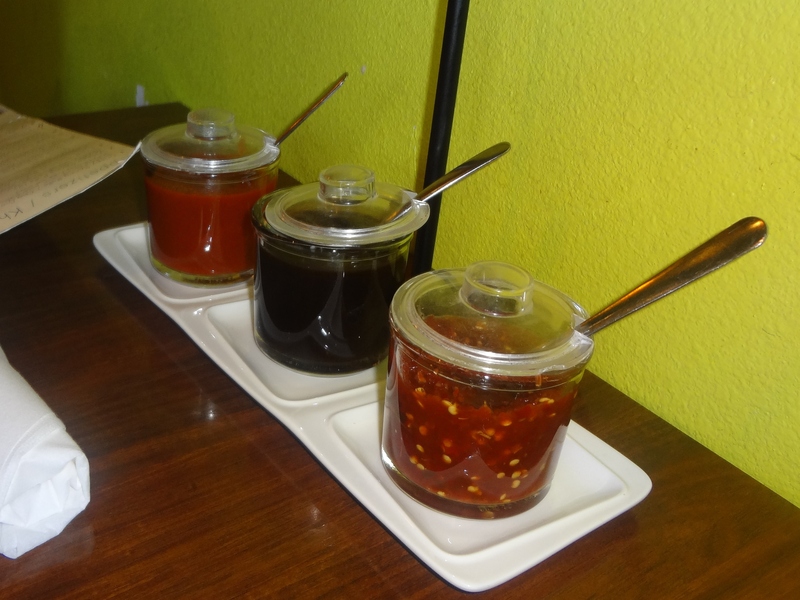 Take a look at what could be the “ketchup or mustard” equivalents for pho. 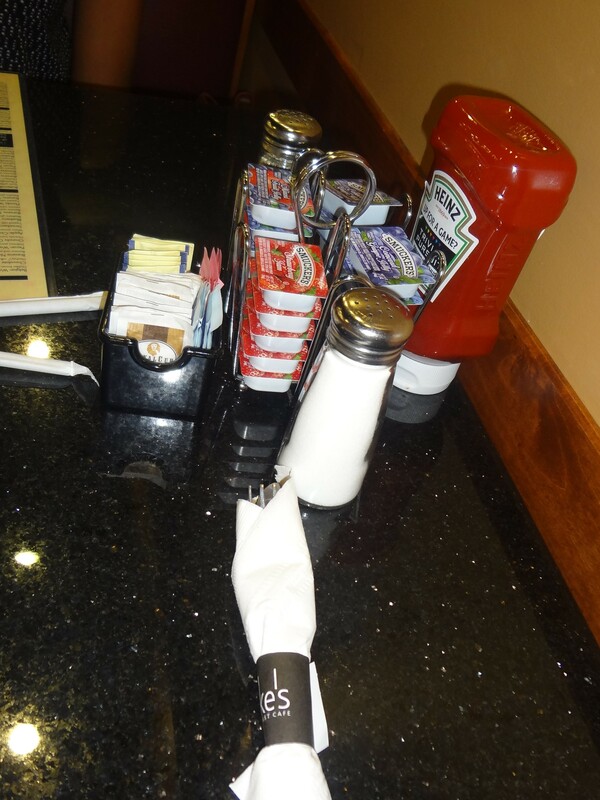 As you can imagine, I was a bit overwhelmed and confused by these complimentary condiments. Our waitress recommended the Vietnamese basil (green leaves from upper picture) accompanied by one whole scoop of Hoisin sauce (middle jar) and a half scoop of Sriracha sauce (top jar). By “easily palatable,” I mean in comparison to the “combination” pho. The upper picture depicts the curry chicken, which is notably spicy and the accompanying “fish sauce” is delicious, but definitely not for everyone. The spring roles were delicate and dainty with “peanut sauce” that tasted exactly like peanut butter. For me, peanut butter is candy/dessert, but for my wife, it was critical that it ended up in our to-go box to be savored again at a later time. The waitress was also helpful enough to package up my pho. I loved it, but the portion size was enormous so it had to come home as well. At first, I wasn’t sure if I enjoyed the pho. My American taste buds were overwhelmed by all of the layers of flavor and confused by the textures of the tripe and the tendon. However, my American taste buds did what many Americans do best, which is assimilate. I woke up in the middle of the night with a craving for this weird stuff, and I happily finished off my pho under the moonlight. Feeling brave? Feeling extra hungry? Feeling multicultural? Give Saigon Bistro a shot. 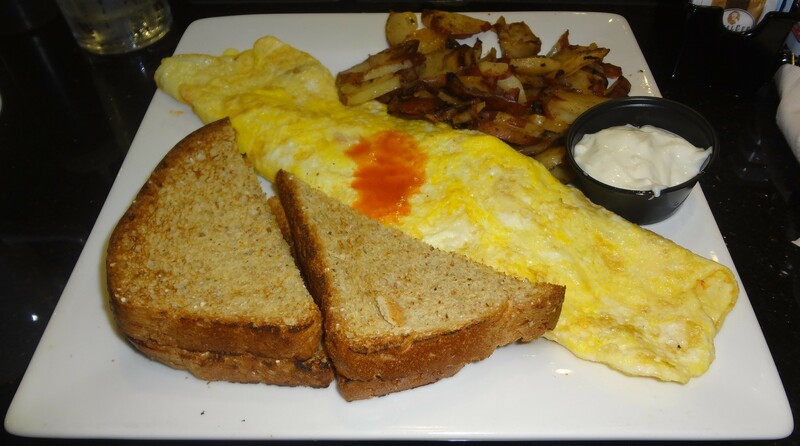 You’ll end up coming back for seconds, just like we did! Personally, I would have never expected to find a pizzeria like Antico’s here in Lakeland, FL. 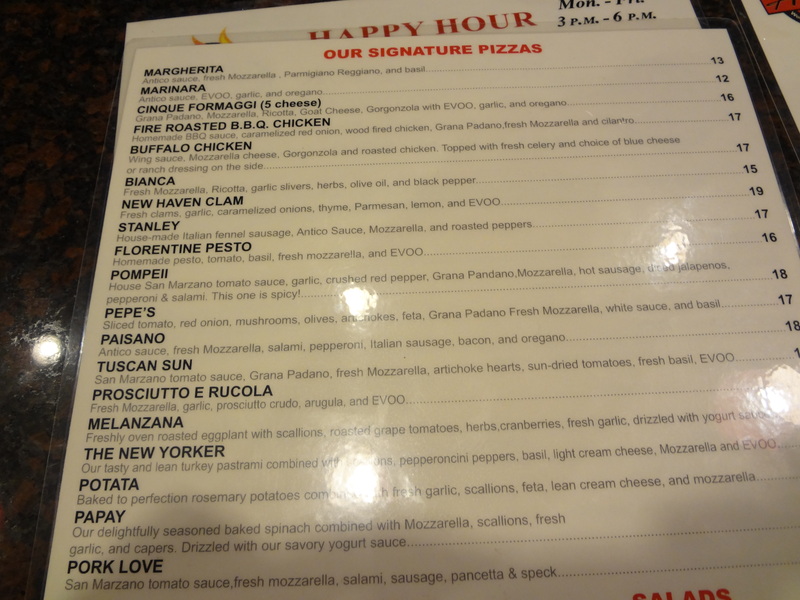 My guess would be that Artisan styled pizza cooked in a wood fired stone oven would be much more commonplace in Little Italy, NYC than it would be in Central Florida. Evidently, I’m a poor guesser! 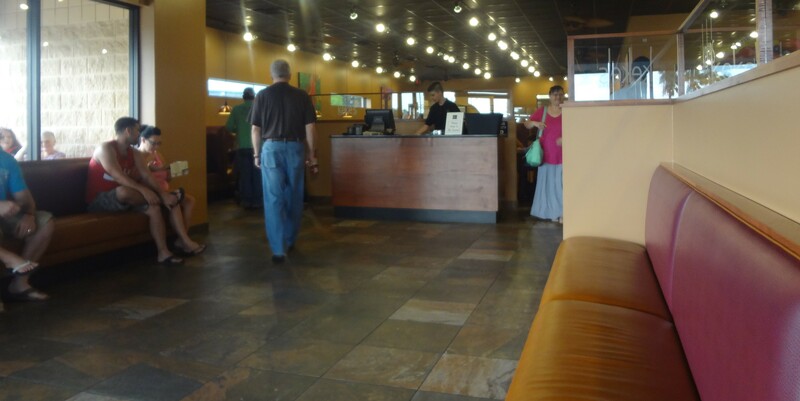 Much like Champino’s in Northside Lakeland, the owners are always on the premises. This helps establish that true “mom-and-pop” feel and really shows how much pride the owners have in their product. 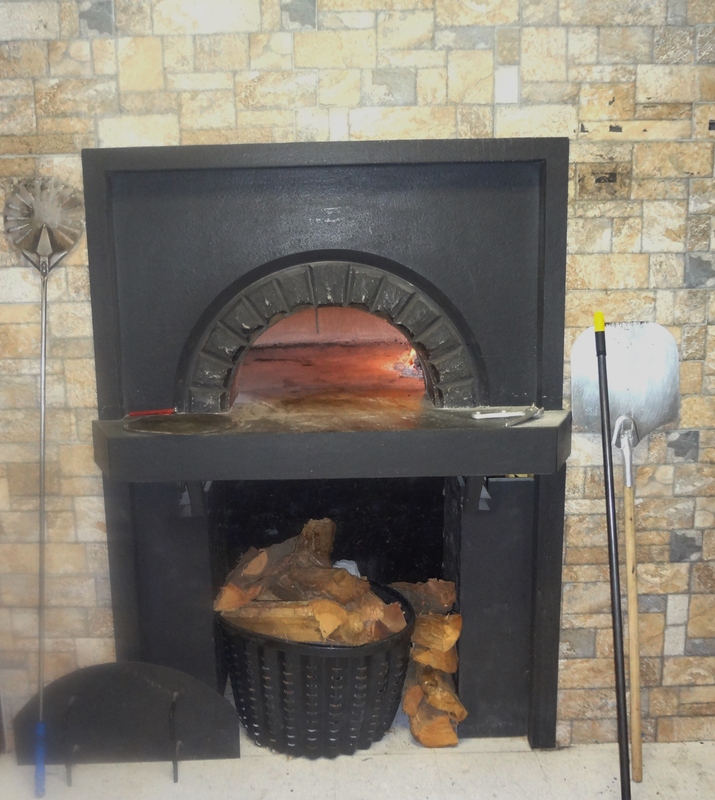 The proud pizza purveyors are quick to remind you that their fare is prepared for you in a stone oven, which is truly what sets this restaurant apart from all of the other pizzerias in Polk county. Before you get to taste the pizza, you will receive a complimentary bread appetizer that showcases what the oven can do. This is called “lavash,” which is a traditional Greek bread. This hollow centered, bubble of bread is both crisp and doughy and serves as sneak preview of their delicious pizza crust. 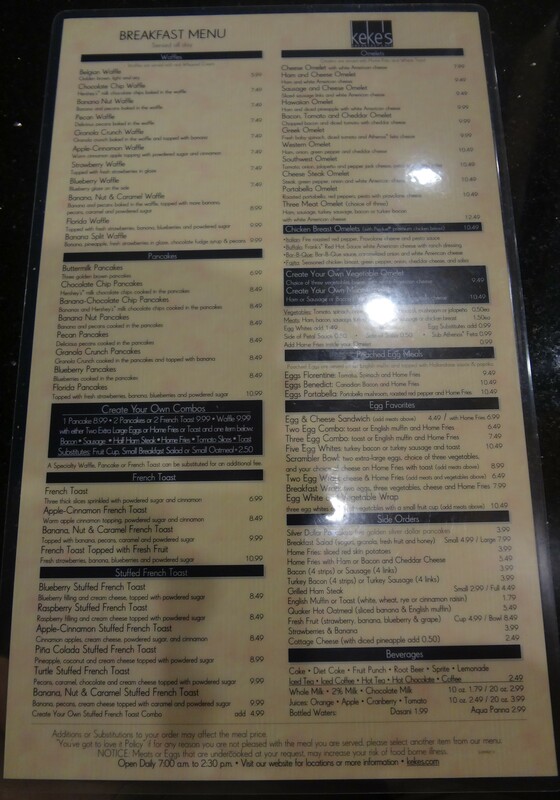 Let’s take a sneak peak at menu! As you can see, Antico’s is very strong in the variety department. 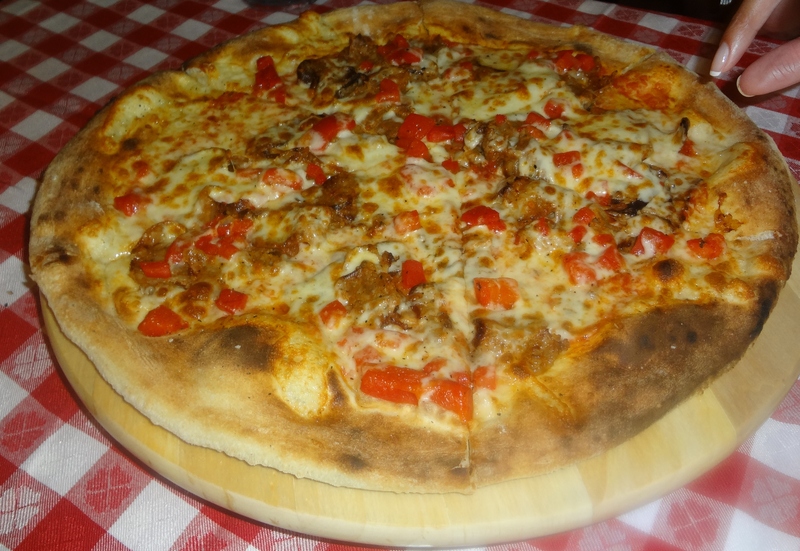 Check out the these drastically different ways you can enjoy your pizza here! Pictured first is the “Stanley.” It features fennel sausage that is perfect for satisfying that meat lover’s pizza craving. 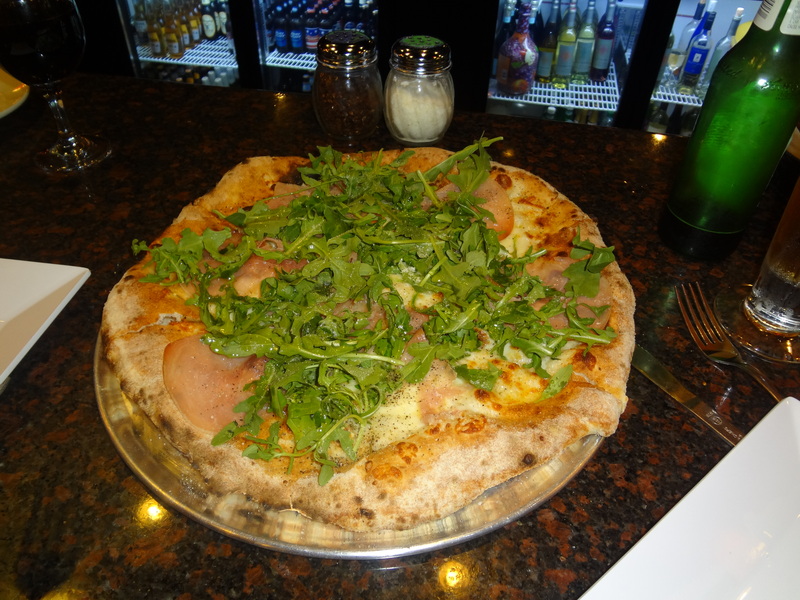 Pictured second is the “Prosciutto E Rucola.” We normally are apprehensive about ordering white pizza because so many white pizzas are bland and dry. This was definitely an exception! It was drizzled in a tasty EVOO (extra virgin olive oil) and was oozing with flavor. What an option! 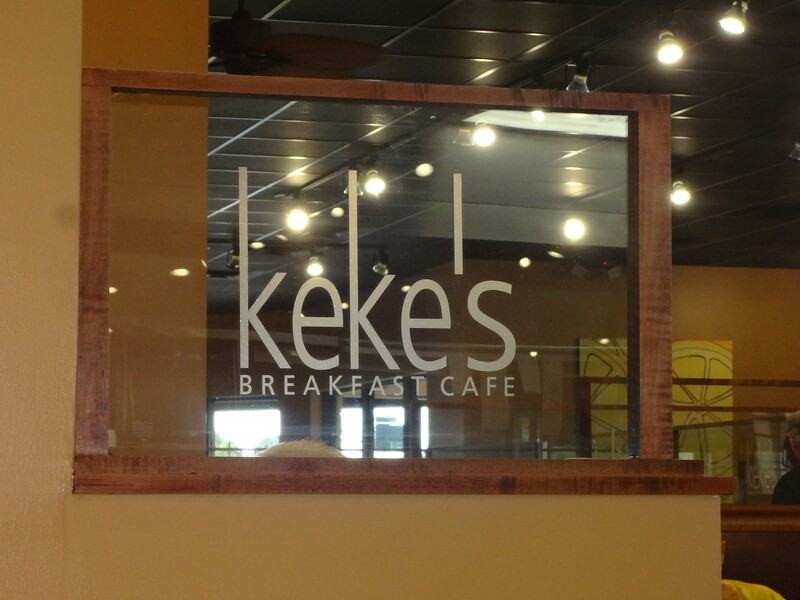 It was an interesting dish, and the other “small plates” and lasagna specials are presumably interesting as well. However, if I had to order only one dish here, I’d go with the pizza. 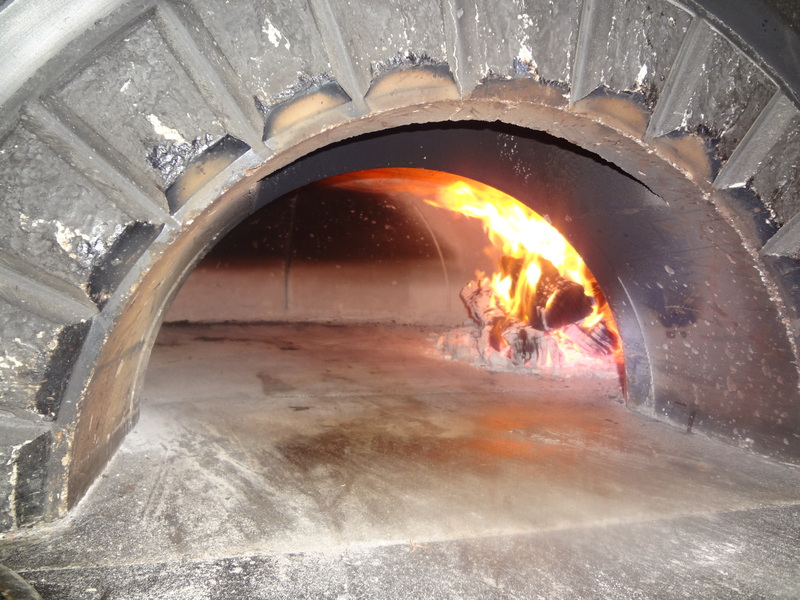 The stone oven is what this place is all about, and inside the oven is where the magic happens! The wood fired crust, fresh ingredients, and strict adherence to classic Napoleon styling are all things that are typically only recognized and appreciated by pizza connoisseurs, and I’m not sure how many Lakelanders fall into that category. Furthermore, I’m not sure how many pizza enthusiasts would think to look for wood fired goodness hidden in a strip mall buried in the southern most tip of Lakeland. That being said, it doesn’t take an expert to appreciate yummy pizza, and the word on Antico’s is out! 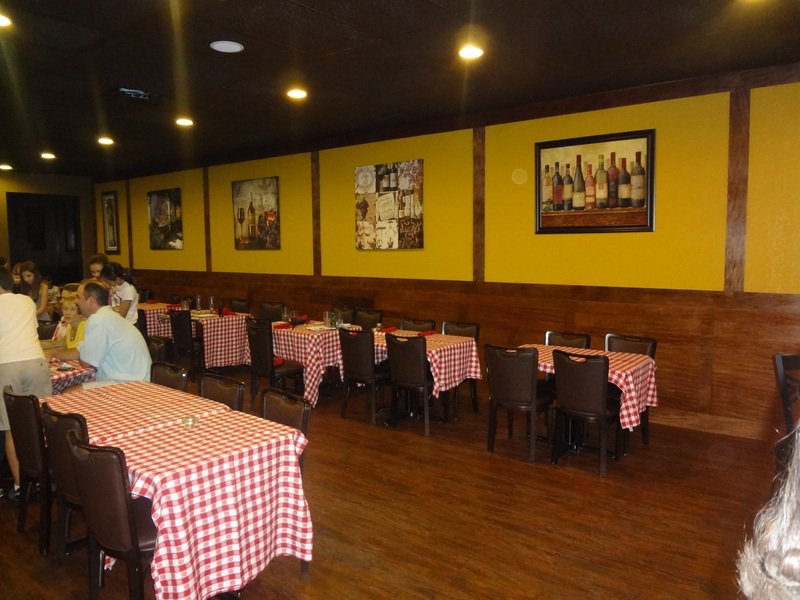 Business is already beginning to boom here, and you won’t be able to call Antico’s one of Lakeland’s “hidden” treasures for much longer! A restaurant chain is a set of related restaurants with the same name in many different locations that are either under shared corporate ownership (e.g., McDonald’s in the U.S.) or franchising agreements. 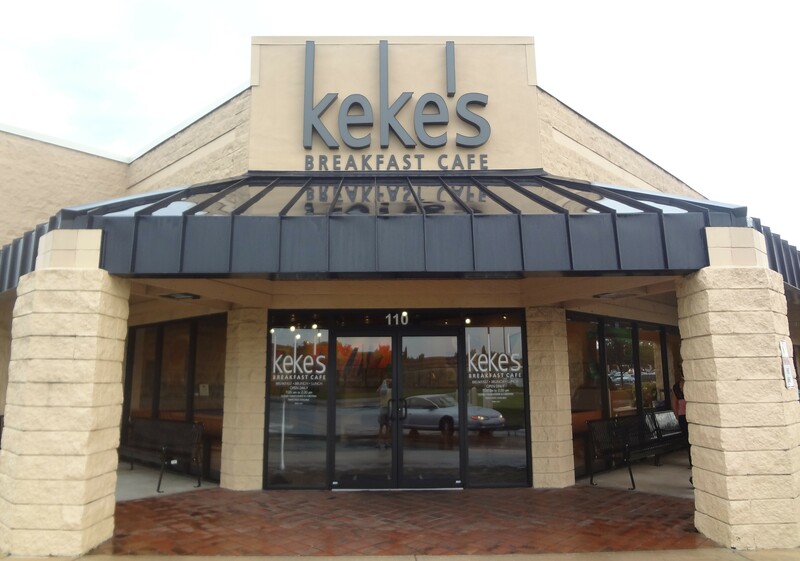 Typically, the restaurants within a chain are built to a standard format (through architectural prototype development) and offer a standard menu. If you read the above definition closely, you’ll notice that Wikipedia uses the word “set” rather than defining the specific number of restaurants necessary to constitute the “chain” classification. Although there are 5 Harry’s Seafood Bar & Grille’s currently in existence, I’d never consider Harry’s to be a chain. Conversely, there are a grand total of 4 Manny’s “Original” Chop Houses, and I very much consider this set of restaurants to be a chain. You’ll soon follow my logic. 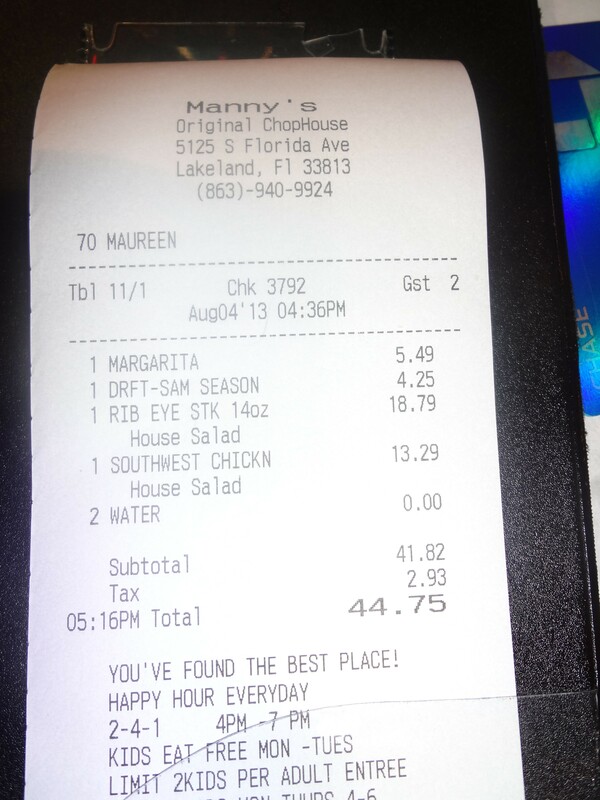 The website for Manny’s Chophouse is a visual summation of the restaurant’s decor. Neon lights and random objects strewn up to hang in the background. 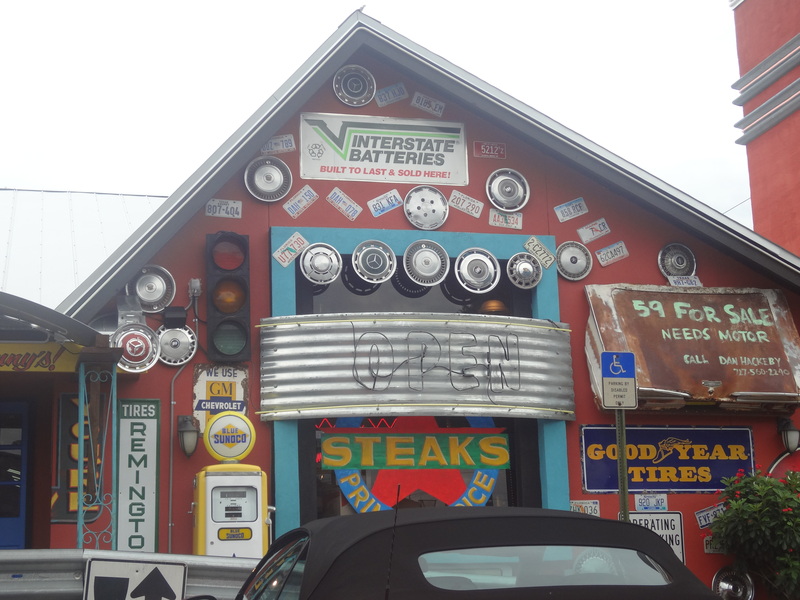 I often refer to this common mode of interior (and sometimes exterior) design as “junkyard theme.” Below is a picture of the outside of the Manny’s in Lakeland, not an actual junkyard. You are certainly familiar with “junkyard theme” because you’ve seen it at Applebee’s, Friday’s, and countless other chains. 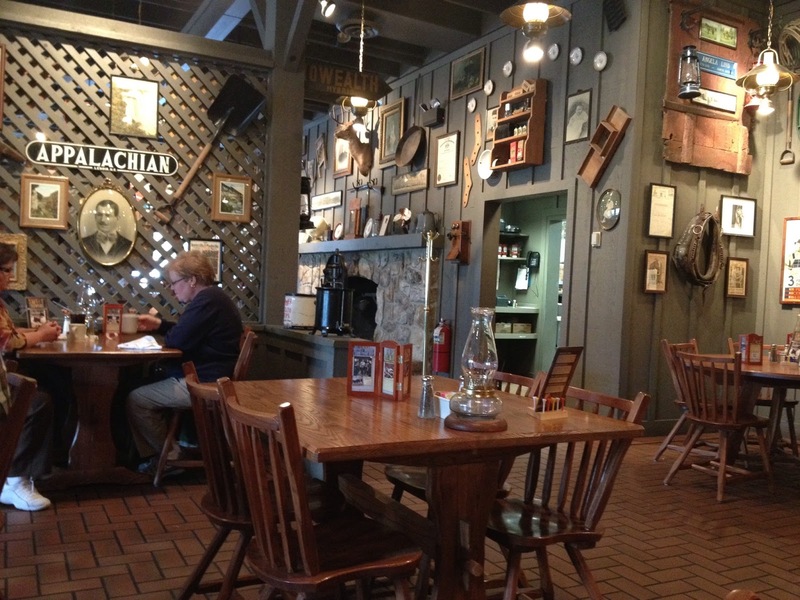 Most notably, you’ve seen it at Cracker Barrel (pictured below). Manny’s is a big time Cracker Barrel wanna-be, the only difference being that Manny’s would rather focus on dinner foods than breakfast staples. 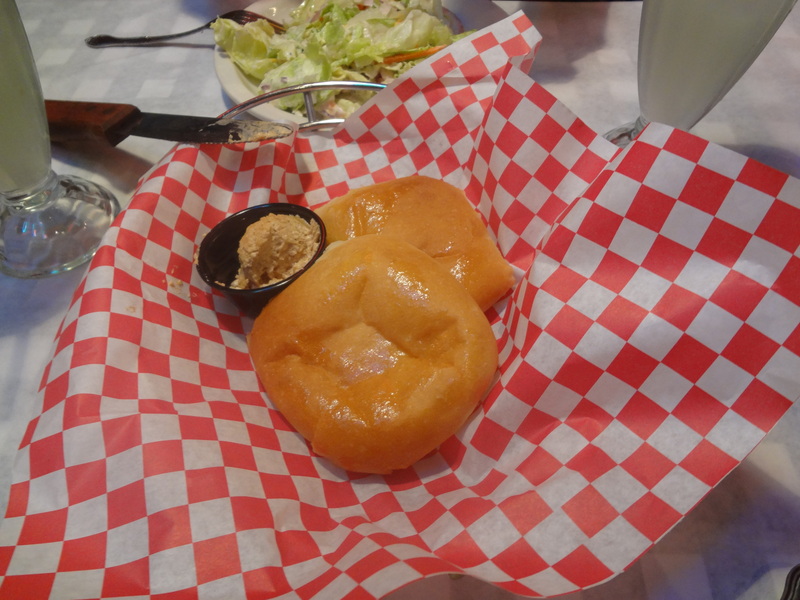 Instead of serving every meal with biscuits and white gravy, Manny’s will automatically serve dinner rolls and salad. 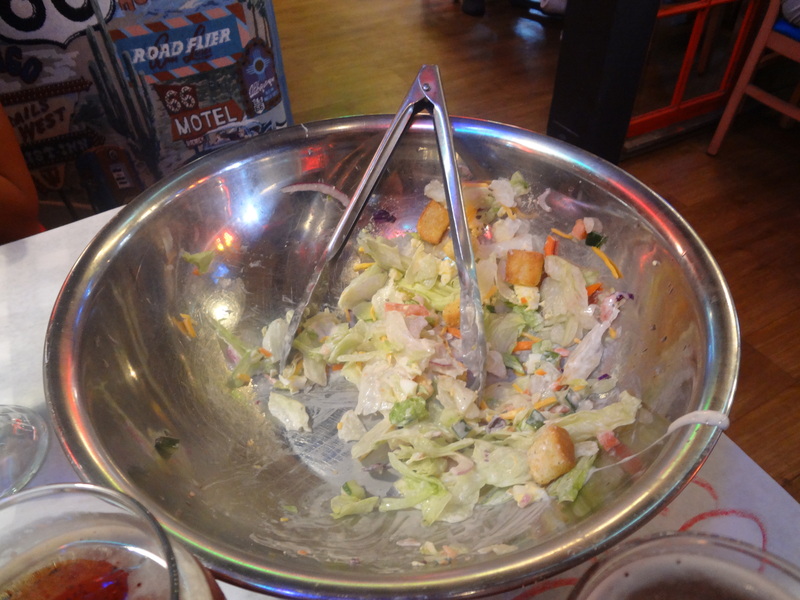 Similar to Cracker Barrel’s famous all-you-can-eat biscuits and cornbread, Manny’s employs a “satisfaction through satiation” strategy with all-you-can-eat rolls and salad. Both the dinner rolls and salad are made fresh and are somewhat decent, which is pretty much the theme for any entree you order here as well. Furthermore, Manny’s goes for overkill with their portion sizes. I decided to give the rib-eye a shot. If you look closely, there isn’t a spec of seasoning on the vegetables. A chain would never want to risk losing a potentially steady customer over something as easily preventable as slightly too much salt, or worse yet, some snooty chef’s personal interpretation of a traditional dish. The steak came out exactly as I ordered it and it was a somewhat decent piece of meat. Places like this become methodical at churning out food that is unlikely to be sent back to the kitchen, which would inevitably slow production. Efficient production is critical in this model because Manny’s will always have a packed parking lot. As much as I hate to admit it, a chronically full parking lot outside of a restaurant is a pretty glaring sign of success. Manny’s has targeted the masses, and the masses come in droves. 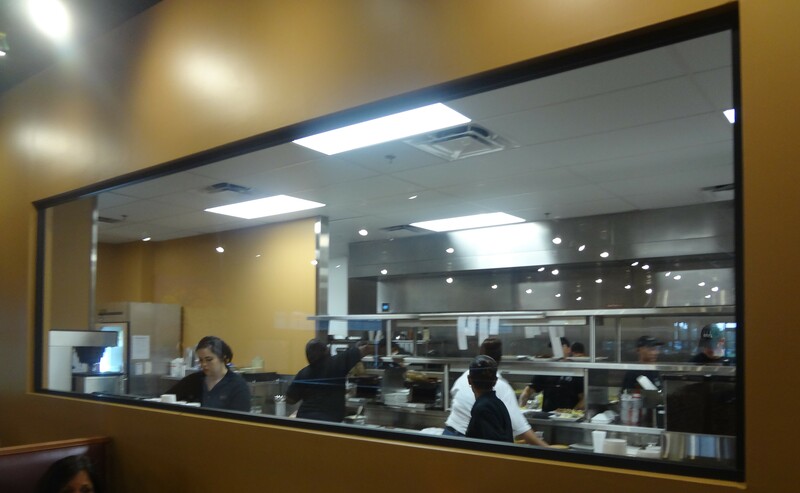 Your food will come out fast, your food will always be consistent, and your food will always be at a competitive price. We came during the cleverly named “2-4-1” drink special listed on the bottom of the receipt, which means we got 4 drinks and 2 full entrees for under $45 bucks. 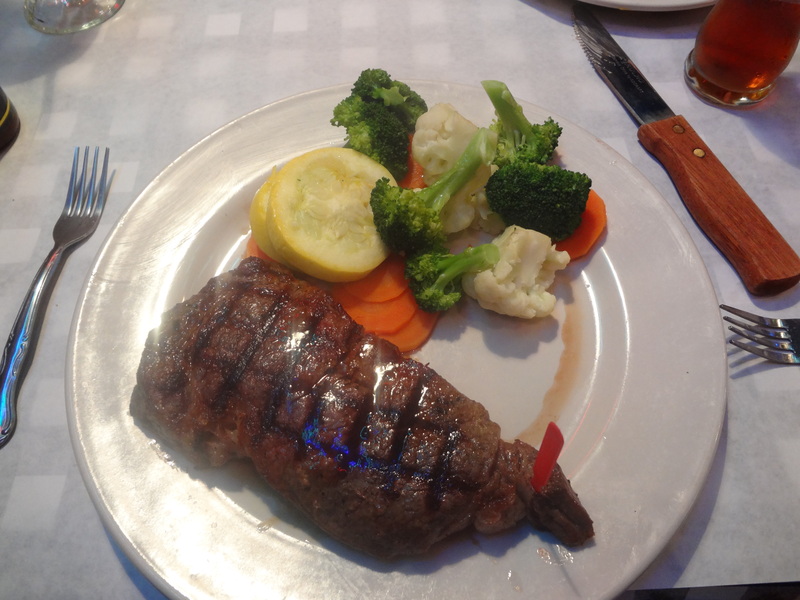 If you have a large family to feed, dislike surprises, or just want to know that your steak will automatically come out right each time, then frequent your local Manny’s “Original” Chophouse. You won’t be alone. 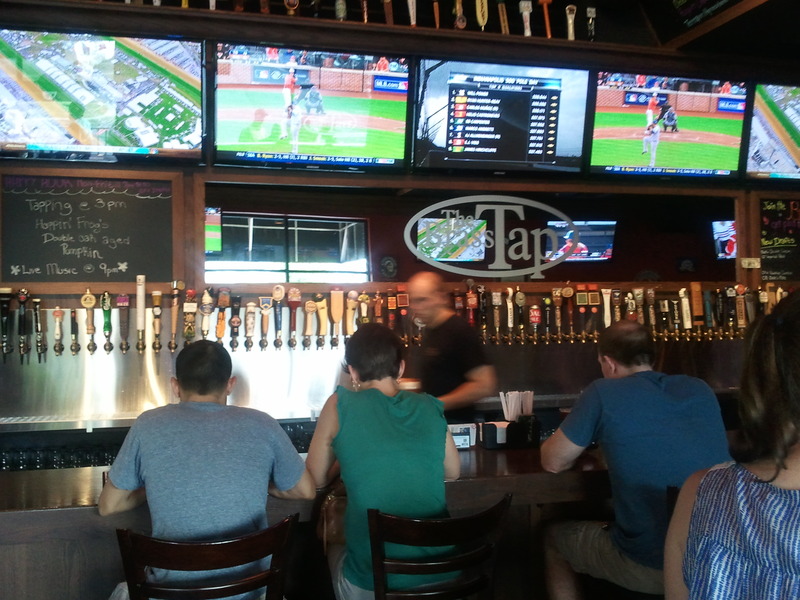 ANY BAR IN LAKELAND WITH 70+ BEERS ON TAP WILL NEVER BE IGNORED BY THIS WEBSITE! Don’t get distracted by all of the TV’s. FOCUS ON THE BEER TAPS! In addition to an excellent and periodically rotating selection of beer, this place also sells cigars. The cigars aren’t a draw for us, primarily because the smoke makes the outside seating almost uninhabitable. For those of you who do not fear second hand smoke,checkout the outside seating. Outside (or near an entrance) is a good place to sit if you want a bite to eat. 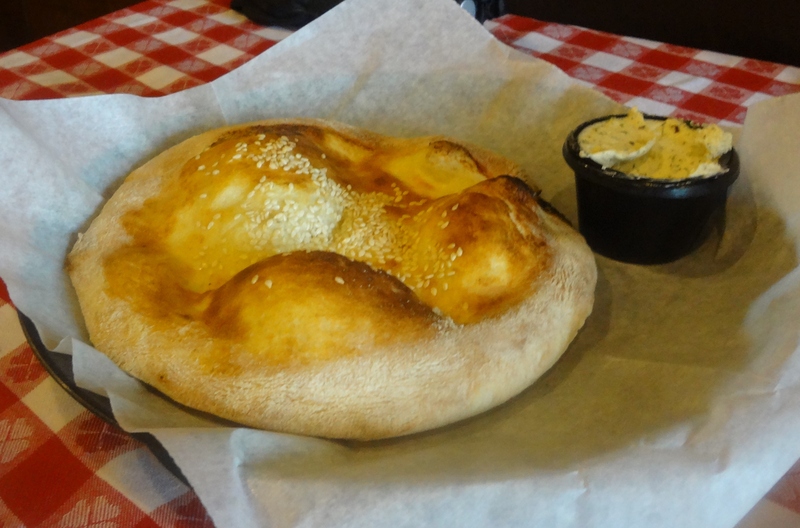 The Brass Tap has a very limited menu; pretzels and pizza pretzels. However, feel free to order off of any menu at Lakeside Village while you hang out here. 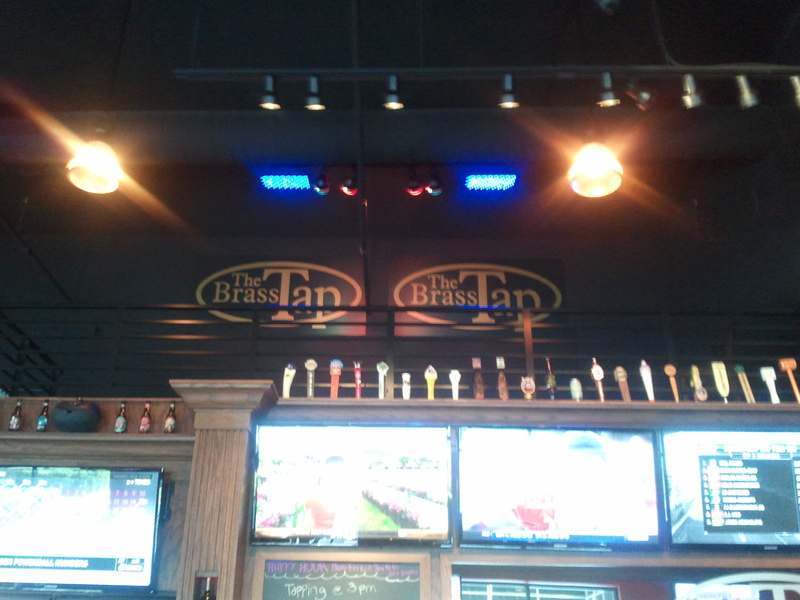 Most of the neighboring restaurants will deliver straight to your table at The Brass Tap. It’s a model used by the entire chain, and it’s kind of fun. The Grillsmith in Lakeside Village actively markets to the patrons of The Brass Tap. Grillsmith regularly litters this bar with their menus and even has a delivery boy designated to The Brass Tap. In addition to having a few beers, getting a bite to eat, and inevitably showing up late to the movie you came around for, there are other reasons to come here. This place has got a cleverly placed, second story stage for live music. 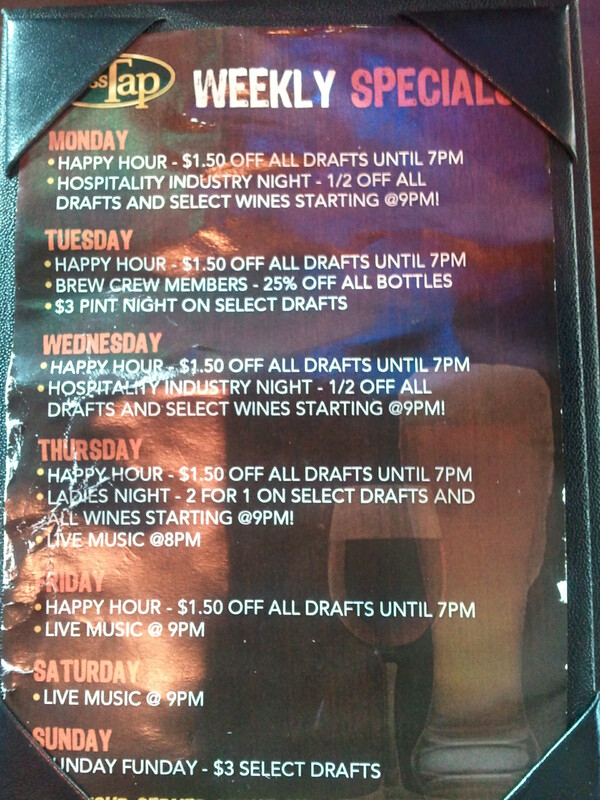 The prices here aren’t a strong selling point, but they do have some decent specials. Last but not least, they got a wall of fame. 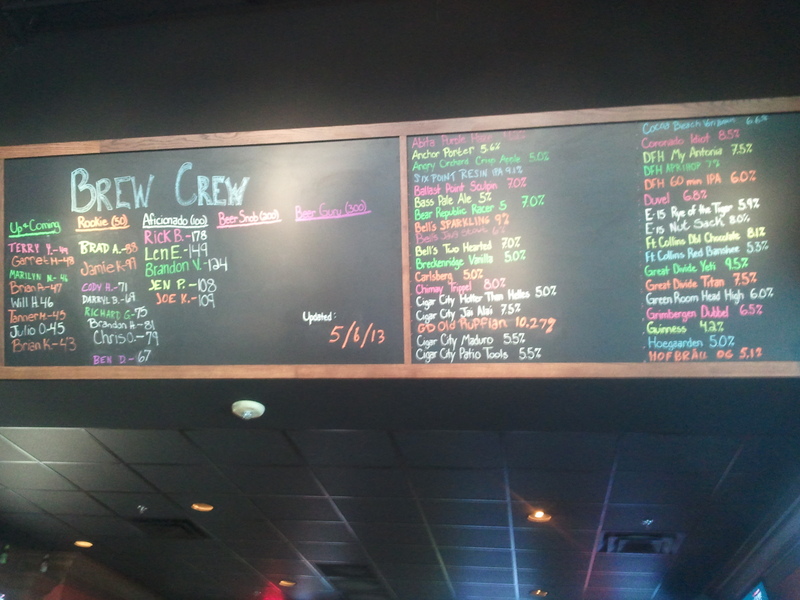 For a nominal fee (I think around $15), you can join the Brew Crew and receive points towards gift cards and acknowledgement on a chalk board for excessive beer drinking.